The anti-corruption campaign in Russia, which has already hit hundreds of officials of various rank (some of them have been indicted on criminal charges) over the past few months, is taking ever new forms. This time the authorities have decided to put the emphasis on the prevention of corruption. The Labour and Social Security Ministry has published recommendations on its website advising officials on ways of avoiding “behaviour that may be interpreted as corruption.” Experts are certain, though, that the latest instruction on how to resist bribery some officials have invented for others will be quite useless. The instruction offers two means of teaching civil servants to be intolerant to bribery – firstly, they are to be trained at special seminars and crash courses and, secondly, supplied with leaflets and handouts with reminders of criminal responsibility for taking and giving bribes. Besides, the civil servants will be told to avoid in business discussions any themes that may be interpreted as a hint at a bribe, for instance, low salary, the wish to send one’s child to a good pre-school centre or school, or to go to a health resort on vacation. The document’s authors believe that a veiled request for greasing one’s palm may be seen behind offers to use the services of a certain company, donate cash to a certain charity fund or even to support a certain sports team. The heads of civil service establishments are advised to “equip the sites where state services are provided with equipment that might help the employees refrain from behaviour that may be interpreted by those present as a promise or an offer of a bribe, or as a consent to accept or give a bribe.” Obviously, the equipment in question is a video camera. Civil servants are strongly advised against regularly taking gifts that cost more than 3,000 roubles (a hundred dollars). Under the law on resistance to corruption that has been in effect in Russia since 2008 civil servants are already prohibited from accepting expensive gifts more than 3,000 roubles worth. In fact, the law has not yielded any results yet, because the necessary by-law (a government resolution) is still being drafted. It is to describe in detail what is a gift, and what is not, how they are should be handed in, and to what body of authority. 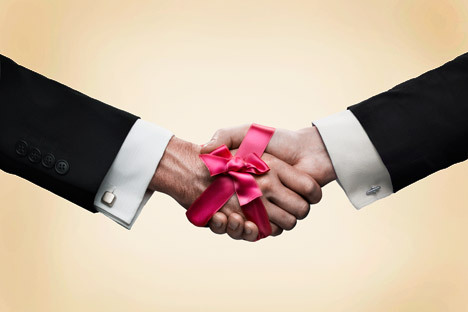 The draft resolution says that the term ‘gift’ shall be applied to any item a civil servant may get as an official at a protocol event or during a business trip. As for stationery items each delegate to an event gets and which are crucial to working at the conference, they are not gifts, of course. Any flowers and perishable products are excluded from the list, too. Officials will be obliged to declare the gifts they get within three days and to present proof of their real value. Otherwise everything will have to be handed in. As to what is to be done to the gifts the officials will be handing in, proposals vary. For instance, the mayor’s office in the city of Naberezhnyie Chelny the other day opened a museum of gifts received by officials. As follows from the mayor’s instruction, “the fund gathers awards and gifts given to the mayor, the deputy head of the municipal entity, the chief of the executive committee and other officials during business meetings and events in the territory of Naberezhnyie Chelny, in the republic, and outside the country. The collection has already received a statuette from the mayor and also an ice hockey stick he got from Tatarstan’s president Rustam Minikhanbov for his 50th birthday. The ministry’s recommendations have triggered a mixed reaction from experts and the Internet community. Quite common are commentaries like: “Oh Lord, it does not take any words or gestures to understand. Just look the official in the eye, and everything will be clear. The message is: give me, give me, give me.’ Now the goat will be instructed in how not to steal cabbage from the garden,” says blogger Nickchay. Many experts are skeptical, too. The deputy director of the Political Technologies Centre, Alexei Makarkin, has told the daily Izvestia such initiatives are unlikely to bring about any favourable effects, because, as he says with certainty, the whole system will have to be changed. “Even if an official has taken a crash course where smart instructors tell the students everything they know about corruption, he or she will certainly not become an anti-corruption crusader. Otherwise, such a splitter will be rejected by the system where he or she works,” Makarkin said. “It looks like feeding a hungry street dog with vitamins,” says lecturer at the presidential Economics and Civil Service Academy, Ivan Starikov. “That’s another imitation of struggle against corruption. There where corruption has been eradicated some very simple methods are used. Such as the responsibility of the bureaucrats before the people who hire these officials. The lack of proper public control is the worst problem of corruption,” Starikov said. The recommendations from the Ministry of Labour will remain on paper, the deputy director of the Anti-Corruption Research and Initiatives Centre at the Russian office of Transparency International, Ivan Ninenko, is quoted by the daily Novyie Izvestia as saying. He believes that the Labour Ministry should focus not on this or that phrase civil servants may utter, but their opportunities for corruption. “Control of the civil servants is the heart of the matter. In a situation where the law enforcement bodies are corrupt it would be naive to think that civil servants will abide by the law,” Ninenko believes.